First time griff owner of an almost six month old pup so very new to this. I've searched through this section to find what information that was available on a griff's coat. So far my pup has shed extremely little hair so I haven't done any brushing mostly because I don't know which brushes/tools to buy. There's never been any matting of hair because the breeder told me she has a very good coat. In fact, it was the very first thing he pointed out when i went to pick her up. 1. What kind of brush do you use for daily/weekly brushing or is it necessary? on which one to get for this breed because griffs aren't very common in these parts. 3. When stripping the hair off a griff is it the wired hair you're removing or the under fur? 4. How frequently do you strip the hair? Right now I really like the length of her coat. How much longer can I expect it to get if she is only 5/6 months old now? Or can that be determined? Thanks in advance! A before and after photo would be great if anyone happens to have them. I'll answer your questions... kind of... I'll also add lots of folks do different things with their Griffs... and there's lots of different coats out there, so the maintenance can be varied for the different coats. 1. What kind of brush do you use for daily/weekly brushing or is it necessary? I just use a steel comb, looks like a flea comb. I don't brush my dogs/pups a lot, mostly when they've come out of the field and I want to be sure they are free of ticks. That's about it. on which one to get for this breed because griffs aren't very common in these parts. You can do it yourself and it's pretty easy. The most common stripping tool is the Mars 10 or 12 blade. You can get a cheaper type from all Walmart that is made for a cat, but it works pretty well on Griffs. I'll try to post photos for you. I strip mine before the heat comes in before summer and during hunting season depending on the temperature. It strips mostly the undercoat. 3. When stripping the hair off a griff is it the wired hair you're removing or the under fur? Answer above, undercoat. 4. How frequently do you strip the hair? Depends on the coat, you see mine above, others might say once a year, or never, or once a month, again depends on the coat. Right now I really like the length of her coat. How much longer can I expect it to get if she is only 5/6 months old now? Or can that be determined? Many Griffs don't get their adult coat until about two years old. It's not easy to know how long it will get. I have found (I breed) that when the pup is born and is a couple of weeks old you can see long, short, tight coats, then the pup's coat may change, but I've found that when they get close to the two year mark they mostly have the coat length/type they had as a two week old pup. This is just something I see when choosing pups for my forever families. Not a science and certainly not a fact, just something I've noticed. Looks like you have a nice looking pup there with a nice coat from what I see. Can't really tell unless I feel the coat, but looks good to me. My suggestion is to not over do it, check with your breeder on what they think the coat will look like when the pup matures and look at older litter mates and parents/grandparents. Sorry I'm not giving you exact answers, coats vary so much that there's no perfect answer IMO. Hope this is okay to put, if not Admin please delete it... I have a site for Hunting Griffs on Facebook. 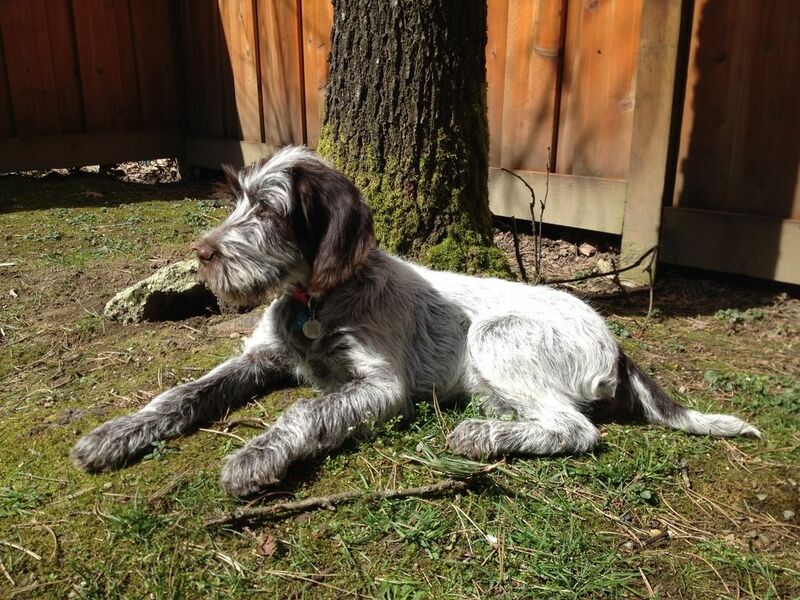 Hunting Wirehaired Pointing Griffons. I did this site just for the Griffs that hunt, not all the other stuff, you might find a lot of tips and info there. Also, I hunt the heck out of my Griff, they are out almost everyday of season, hunting or guiding. I don't show my Griffs, folks that show want the coats stripped in a certain manner, I just keep mine up so the dogs and pups are clean and safe when hunting. Last edited by centershots on Tue Jun 13, 2017 1:26 am, edited 1 time in total. Cheap one I've picked up at Walmart when traveling and I needed one for me, or someone I met on my travels. (I go all over the country hunting, speaking and judging.) This works pretty well if you need one quickly. Thanks for the info, George! Where do you get those Mars 10 or 12 tools? Not sure I've seen them in the pet shop stores up here in BC. I've got a shaggy, 2 year old male who I use a Furminator on once or twice per month, depending on how many dreadlocks he's building up. I also get him stripped twice/year and the lady who does it takes off a lot of hair. It gets hot in Louisiana so I do it in the late winter or early spring, and then again in July to help keep him cool. They way he's got hair in the winter when we go to colder places to hunt. Aside from going over him for burrs every time he's been out in the field, I also trim the hair between his pads and yank his ear hair every other month at the latest. I used the Furminator between stripping sessions. It and the Mars only do a partial job. Twice a year, I'd do a complete stripping with a stripping knife. It gets rid of the entire wire coat so the new coat that grows in is all of the same length and age. The outer coat will go dormant when it reaches the length that genetics control and a new, fresh coat will not replace the old coat until the hair follicle has the old, dormant hair removed. Griffs are not active shedders and do not give up the old hair automatically like active shedders such as the Labrador. orhunter wrote: I used the Furminator between stripping sessions. It and the Mars only do a partial job. Twice a year, I'd do a complete stripping with a stripping knife. It gets rid of the entire wire coat so the new coat that grows in is all of the same length and age. The outer coat will go dormant when it reaches the length that genetics control and a new, fresh coat will not replace the old coat until the hair follicle has the old, dormant hair removed. Griffs are not active shedders and do not give up the old hair automatically like active shedders such as the Labrador. Do you take your dog to a groomer to get the stripping done ,,,,or do it yourself and if you do, what brand name of stripping knife do you use? My dogs/pups have pretty good coats, so not much stripping needed. The pup I have right now, CK, IMO has one of the best coats I've ever seen, or felt. To me it's the Holy Grail coat I've been breeding towards. He may not need much stripping at all. His father Gus, son of Mr. Brown also has an excellent coat, so he almost never gets stripped. But we do hunt a lot and that helps with the stripping of the coat. If you're out in the fields a lot you'll need less stripping... you'll get a feel for your dog by just watching how his coat develops and if it mats ups... or not. I bought a decent knife at the local big box for $7 but that was a few years back. I never pay anyone to do what I can do. I strip the dog in the spring using this style of knife. Dog gets brushed occasionally, more so in the fall. She gets a bath when she stinks. I trim her eye furnishings occasionally because I believe a hunting dog was meant to see. I also trim the fur around her paws just so she drags less in to the house. Overall, maintenance is pretty low. I am probably a bad Griff owner. I have never stripped my dogs coat. I brush her out a few times a month. She sheds burs easily. Sometimes cockleburrs get caught in the furnishings. Other than that she is low maintenance. I ended up ordering one of those Mars 12 tooth tools and ran it through Sako's coat this afternoon. Pretty surprised at how much hair came out,,,,,hopefully I didn't go overboard but I think I only made 1-2 passes over the entire coat. Okay,,,,good to know. All that hair coming out was freakin me out a little bit! LOL So,,,,,should I be going over her coat some more or wait another few weeks?? 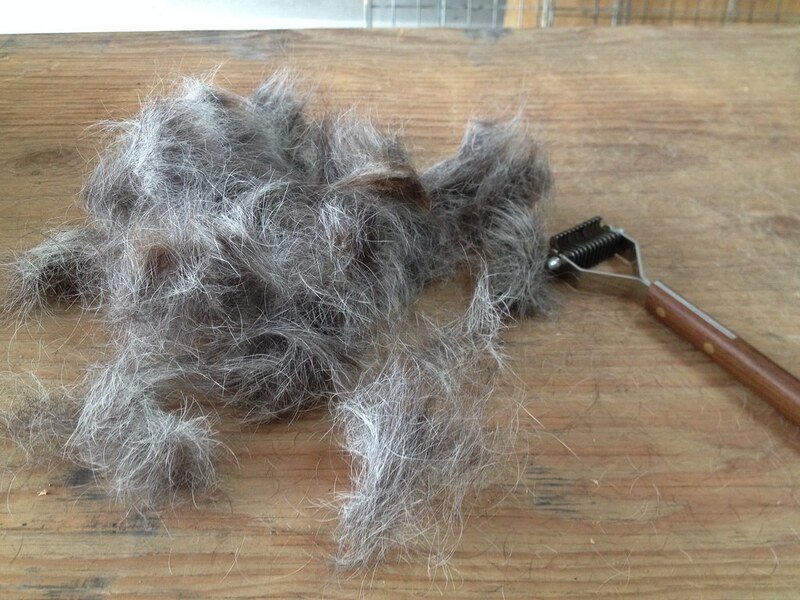 You wouldn't happen to have a photo of a finished brushed out dog, would you?